The Fade To Black jeans are super comfortable. It’s “glory days” for all of those “cold” people out there. These jeans are thermo-lined and keep you warm when you are cold and cool when you are too warm (yup I tested these suckers out all winter in the FREEZING warehouse and during summer – no sweat). These babies are still stretchy, but a little less so than the Black Betties. They allow you enough flexibility for the gym … not as much for yoga – but passable if you’re in too much of a rush to change to get to a yoga class in time. 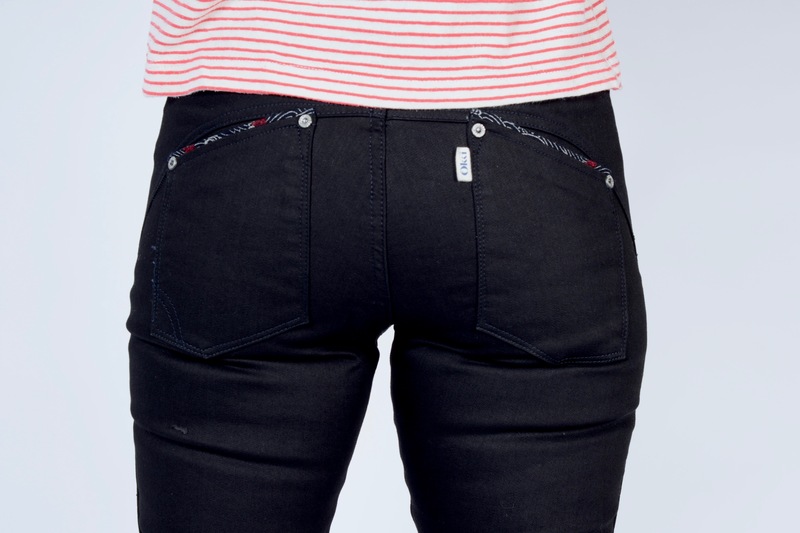 These jeans are designed to complement your day and cut (designed) to flatter everybody. Colour: Black (will fade only slightly). Fabric: Crafted from 10.25 oz, yoga stretch, organic recall denim. 38.5% cotton, 9.5% elastane and 52% PES. Unique sashiko / Koi dark printed Japanese 100% cotton trim in navy. Fit: The Fade to Black jean runs true to size for extra snug jeans. Fabric will soften for life-long comfort. The perfect "Spring weight", fitted, jacket, in a kaleidoscope of glorious indigo, reds and alike. This garment has had days, weeks, months and perhaps even nearly a year of sampling, pattern making refining and fabric sourcing put into this slice of divine tailored goodness. Every day, all day jacket - to be worn over lightweight tops, long or short sleeves. 2 External pockets plus 1 internal pocket Slim fit sleeves - will fit a long sleeve tee or a shirt underneath Okki label Mid-hip length Small Batch. Limited edition. Made in: Geelong, Australia. 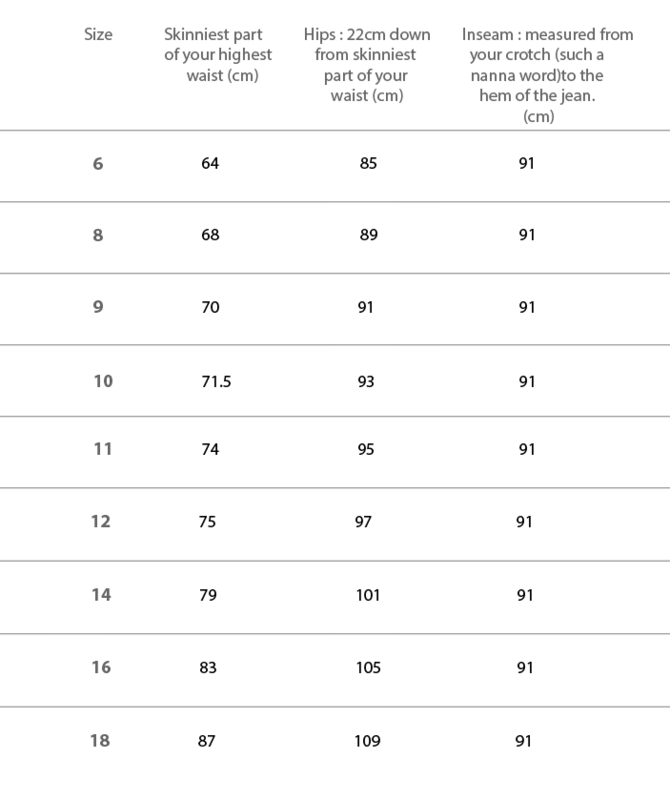 To find your clothing size we recommend that you use our international size guides using body measurements. All Okki orders are delivered within Australia by Australia Post parcel bags. Orders under $300 AUD, shipped to an Australian postal address, will be charged a flat fee of $10.00 AUD. Orders over $300 AUD will be shipped locally for FREE. The estimated delivery times shown on our website are provided by Australia Post. Your Okki goods should arrive at the delivery address you have provided within 3-7 business working days. Please allow for delays during seasonally heavy delivery times, sales periods and public holidays. If the item you have purchased online is not suitable, Okki will happily accept returns of unworn, unwashed, undamaged or defective goods. All tags must still be attached for a full refund or exchange within 14 days of original purchase. If a returned product does not meet these set standards, we reserve the right to reject the return. Flash sale, discount offers or sale goods and gifts are excluded. If you purchased your Okki product from a selected Okki bricks and mortar retailer, please return the goods to the original place of purchase. Shallow front pockets to avoid VPL (visible pocket line). 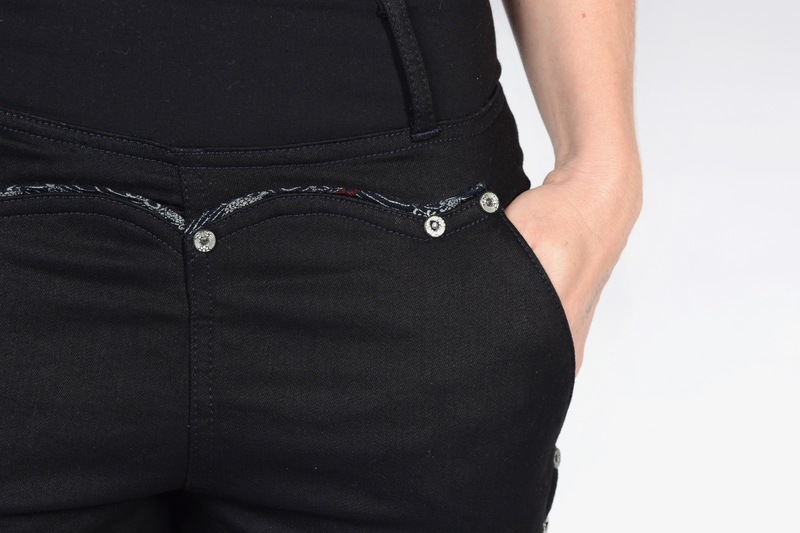 Deep back pockets – will fit your phone. Leg inseam measures 36” with built-in self-hemming. Wrap around leg seam ensuring a snug (yet a little roomier than the original Black Betties), skinny fit. No side seams around the waist giving you a flattering waistline. For easy care refer to our care page. Trim detail fabric – 100% Cotton Japanese Koi – navy, black and red. Hemming guide: We have designed your Okki jeans so they are easy to hem yourself, at home. Follow our DIY hemming guide to learn how to hem your jeans using a few simple steps. You will need some tools to get started; Scissors, ruler or measuring tape and tailor’s chalk. VIEW HEMMING GUIDE. 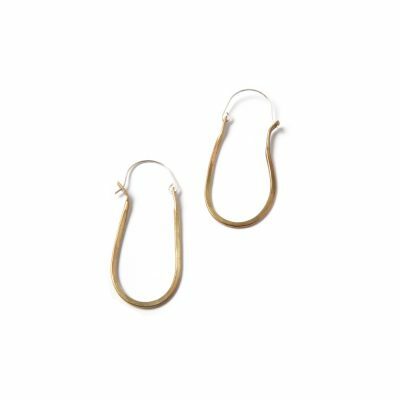 Each earring is hand hammered and has a hand made 100% sterling silver ear hook. The brass is prone to oxidisation which causes the metal to get black or dark spots. A simple wipe over with steel wool and some dish soap will have them back to "as new" condition. The easy woven top for warmer days and nights. Layer over your favourite long-sleeve top in cooler weather. Detailed with contrast print fabrics, top-stitching and a little surprise at the back. Triple pleat and contrast trim detailing. This is a limited edition Okki product. Colour: Indigo and white stripe with contrasting geometric indigo and white trim. Fabric: 55% linen and 45% cotton. 100% cotton fabric trim. Fit: Boxy, loose, breezy fit. Cut to hip length. Short capped sleeve Wide crew neck Dropped shoulder Front pockets with contrasting print fabric lining Designed to slip over head with ease Signature Okki labels and trims Limited edition Made in: Melbourne, Australia.